During these weeks I’ve been championing a high-earners income tax, I’ve gotten a lot of incredulous and/or angry pushback from critics. It’s a slippery slope, I’ve been warned; the tax brackets will eventually creep down and the rates creep up until we’re all paying an income tax we can’t afford. It’s just one more tax, I’ve been told, on top of the property and sales and gas taxes etc. we already pay, which will never go down once an income tax is tacked on. And besides, who wants the hassle of filing all those complicated state tax forms? And then there are our righty trolls, instinctively defending the welfare of the wealthy. For despite the fact that their state and local taxes currently amount to but a tiny portion of their personal income compared to that of lower and middle income taxpayers, per capita taxes on our most affluent citizens already comprise a disproportionate share of the total revenue stream. Thus to increase their burden any further would be unfair, and indeed, immoral. Or so we’re told. 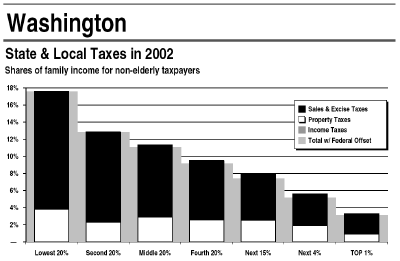 Under the Washington Model we would repeal all of our existing taxes—sales, property, B&O, gas, tobacco, everything—and replace the revenue with a single, broad-based income tax that would be paid by every household in the state, regardless of income, and with no exemptions, deductions or loopholes of any kind. You earn $16,000 a year, you pay taxes on $16,000. You scrape by on $1.6 million, you pay your state income tax on that, regardless of how you earned (or unearned) your money. One tax, and everybody pays it. Couldn’t be fairer or simpler than that, and best of all, we’d all know exactly how much our government is costing us, all the better to judge whether we’re getting a value for our tax dollar. But wait… what about the unfortunate wealthy? At a flat rate of 8.9%, roughly equivalent, on average, to what we currently pay in state and local taxes, a family earning $1.6 million a year would pay $142,400, compared to only $1,424 for the family earning $16,000. That hardly seems fair. So clearly, we need to move to a graduated income tax… though not quite graduated in the direction we’ve come to typically expect. No, under the Washington Model, in an effort to more fairly treat the affluent families who, after all, pay the bulk of our taxes, our graduated income tax would be graduated regressively, attempting to even things out by placing the highest rates on the lowest income brackets, and the lowest rates on the highest. Under this much fairer system, a family earning $1.6 million a year would now pay $49,600 in state and local taxes. That’s still a helluva lot more than the mere $2,816 paid by a family earning $16,000 year, but it’s a lot fairer than it was before. Sound crazy? Would anybody in their right mind propose a backwards system that taxed families earning less than $17,000 a year at 17.6%, while taxing families earning over $922,000 at only 3.1%? Is there a snowball’s chance in hell that even the Seattle Times editorial board, let alone voters, would ever approve such a brutally regressive and mind-numbingly stupid tax system? Well… welcome to the Washington Model, for substitute our current sales, property, B&O, excise and other taxes and fees for the proposed regressive income tax above, and that’s pretty much the same system we have now. Change can be scary, and that makes it emotionally easy to defend the status quo. But intellectually? Not so much. Very good, Goldy — one of your all-time best comments ever! Let’s see the trolls defend Washington’s tax system now! You really should send this to every newspaper in the state, along with a note asking them to run it as a guest editorial. I’ll bet Frank Blethen doesn’t have the guts to print it, and I’ll bet that rightwing rag in Vancouver wouldn’t print it, either.
? ?every newspaper in the State?? Errr ahhh. That would cost a 49 cent stamp! Moreover I no loner read the ST, I decided it wa s not worth the effort to place the waste paper in the recycle. Wow. This is a really interesting post; puts it all into perspective. I know some of you all have said it’s not realistic, but you get rid of the sales tax completely, sunset the existing sales tax add-ons to fade out over 20 years, and I’ll gladly support an income tax replacement. I suggest an alternative. Income taxes DO discourage earning money. They also reflct very poorly the service the State provides each of us. I suggest a wealth tax. Other than the real estate tax, which is certainly NOT progressive, we do nothing to tax wealth … esp. non productive wealth. I know, for example, Roger Rabbit has a huge hoard of gold coins he keeps in a burrow under his carrot garden. I pay mucho dollars t the cops to protect RR’s trove from thieves and all those Krugerands contribute nada to our economy! how about a tax on lobbyists who teabag legislatorz? a dillion dollarz a dip. @7 I didn’t want to make it too hard for Goldy. @8 I’m willing to pay a wealth tax on my hoard of gold coins if it’ll lower the sales tax. I dunno about that. Might be a trifle simplistic. Some means might be found for encouraging people who have “discretionary wealth” to invest the liquid portion thereof in a way that stimulates real growth. This being differentiated from conning middle-class families into hocking their primary residences and handing the proceeds over to the Wall Street magicians*. It’s pretty goddamn specious to claim that Washington discourages people from amassing wealth, considering that we’re home to the richest person on the planet. PLEASE DO keep calling Barack Obama a socialist and his policies socialism. You are making socialism very, very popular. I say jack all the taxes. Lets make Washington #1 in every category of state taxes! Again, I say the study that’s cited links in the 17.6 percent figure the sales taxes combined with current property and excise taxes. I still fail to see how an income tax as a replacement for sales tax would do anything to alleviate the tax burden since the property and excise taxes would still be there in addition to the income tax. And yes, this would creep down the income ladder over time. See the Federal Income Tax history as a guide. And name one tax(not counting tolls on roads) in the history of the state of Washington that’s been repealed by legislative initiative (not voted on by the people) or actually been allowed to expire when the original purpose of the tax has been paid off. I agree with Blue John, get rid of the sales tax completely, both state and local add ons, if you are going to institute an income tax. Let’s hope the Republicans stay out of power in this state, otherwise we might get a regressive tax system similar to what Goldy is proposing. Whoops — the Republicans are way out of power in this state, and we have this horribly regressively tax system anyway. A family earning under $20,000 should pay no income tax at all. Other than that, I am good with the post. Drop sales and B&O and then cut property appropriately. Replace with a fair income tax. I don’t really want an income tax. But if we have to have one then none of this “hybrid” crap our legislators keep talking about. If we have a progressive tax then there is a counter incentive to progressive income. Interestingly we have NO counter incentive to increases of wealth outside of income. You can accumulate billions of dollars in wealth int his countary and NEVER pay taxes! Because there is a real cost to the rest of us of protecting the property of the uber rich. Do you real think that the indeorect costs of supporting Jeff Bezos are the same as the indirect costs of supporting Roger Rabbit? Oh? Other than in state real estate taxes and some modest other property taxes, tell me how much difference there is in the taxes paid by a WASTATE billionaire with his money invested in yachts and Krugerrands vs. some 100k programmer working for Nintendo? Yep .. though this may be a federal issue. I wonder how much lof the Bernie Madoff scheme is going to fall on taxpayers because the uber wealthy investors will now claim loss of wealth? If loss of wealth is a tax deduction why isn’t a gain of wealth taxable? I think we all agree on the problem (regressivity, and highly unequal treatments for special interests). We *all* agree on a need for income taxation, not only for equity but to reverse the excessive numbers of rich people who move here and undermine our culture and social cohesion. One avenue is REFORM the B&O tax into a VAT system. It is not that different from a VAT, but needs to be broadened– and by maintaining a floor exemption like, 50% of the national median income, and exempting maybe food, you get some progressivity. Let’s get some really smart, experienced people in here from Europe and Japan who have VAT systems, for a competent design. @18 Find somebody better than Mark Griswold to run against Frank Chopp. Preferably a Democrat who isn’t owned by BIAW. The B&O tax is nutty! But, it is not much like a VAT. I also suspect that a VAT would drive Boeing and MS nuts. This e4sp true for MS since their value added is VAST. The issue of taxing corporations at thew state level is fascinating. I suspect that the bulk of MS tax burden here may be real estate tax! What other taxes (besides B&O) does the big green giant pay? Same is likely true for Boeing unless there is a sales tax on super expensive big silver birds. Howsa about YOU run? I will even chip in for a top hat with ear holes! In Daddy Love’s tax table improvement, they’re not income levels but brackets. IOW, the first $17K of your income it taxed at one rate, the next $31K of your income is taxed at another, increased rate (represented in my table as the increase over the previous bracket’s rate). And I cut out a bracket to simplify everything. Now let’s see if tables render in comments. Well, they don’t, but you get the idea. If we can not pay WASTATE’s bills … DECLARE WAR! WASTATE has Indian Island where all the boome bombs are kept and .. we got the boomers as well on the Hood canal! 1. Gov Gregoire call up the National Guard. 2. Order them to seize Indian Island and the Trident base. Threaten to attack Hawaii, California and Alaska if they do not cough up! They’ll be happy to take your money. I prefer to not have an income tax and keep what we currently have. Better the devil we know than the devil we don’t. Also, I don’t believe any government has the right to know what my income level is and where it comes from. I don’t believe any government has the right to know what my income level is and where it comes from. Really? I used to have a relative like you. He worked for the mafia as a pimp, slaver, and murderer! What do you do? Gov Perry of Texas asserts their right to secede! I suggest we invade Texas and Alaska! We can use their oil to pay of the national debte! Responding to Blue john’s post about the Forbes rankings. It’s weird to compare state taxes by themselves because every state treats school funding differently. Some states (Washington) fund a large proportion of school funding at the state level. Other states fund a large proportion of it locally. Since this is such a big proportion of state and local spending it’s more interesting to compare the combination of state and local taxes, instead of just state or local by themselves. The Tax Foundation, the group that brings you “Tax Freedom Day” does a lot of good work analyzing America’s tax system. Their analysis shows that we rank 35th in the country in the total state and local tax burden faced by our residents. Interestingly, California ranks 6th in this analysis at 10.4% of personal income going to state and local taxes. Oregon is 24th, at 9.4%. We’re at 8.9%. It’s always interesting to look at comparative data between the states, but it’s worth taking the time to do comparisons that make sense. And to add on to Rep. Hunter’s comments, by comparing per capita taxes as opposed to percentage of personal income, the Forbes rankings overstate the level of taxation in states with high rates of personal income. Moreover, focus on taxes is very misleading because different states provide different services. A more meaningful concept may be net disposable income after fixed costs such as food, rent, transportation, health car, retirement, and education. Using this measure, the US as a whole does very poorly relative to countries with more efficient government services. This is especially true for health care and education. For those who qvell over taxes, I suggest looking a bit North. Many Canadians who came here because out taxes were lower have gone home once they realize how expensive education and healthcare are in the USA. The concept of disposable income is also closely related to our ability to keep and attract high tech employers. Giving Boeing a tax bennie is dumb IF at the same time we increase their costs of doing business by failing to maintain the schools and roads. Would anybody in their right mind propose a backwards system that taxed families earning less than $17,000 a year at 17.6%, while taxing families earning over $922,000 at only 3.1%? No one in their right mind would propose anyone should have to pay as much as 3.1% of their income in taxes. I have a little trouble with your math… I’m in your next to the top bracket and dude, my property taxes alone are higher than 5.2%. So not sure your model holds all that well.. I admit I’m a small data point but all those in Medina and Clyde Hill would likely dispute the table above.. I think you’re missing a few things too.. I don’t get to deduct the sales tax or property tax on my federal taxes because my AGI is too high, my deductions are pretty much gone. So my state burden does nothing to lower my overall tax burden where it does for those of lower income. In general I’m more in favor of a consumption oriented tax than an creation oriented tax. I’m happy if you want to remove the sales tax from basic food staples and clothing under a certain value. Pennsylvania does this to avoid taxing the poor on necessities. Jack up a luxury tax or even add an income tax on unearned income for those making over a certain amount like New Hampshire does. I honestly don’t mind paying higher taxes, and it may be that Washington taxes people improperly although I do dispute the numbers you use. I’d just rather pay them when I consume rather than when I earn. And by the way, man, all the comments about Washington being worse than California leave me speechless. I lived in the bay area 15 years ago. Practically, California was WAY WAY worse tax wise than here and you got WAY less for it. CA even had Mass beat and we didn’t call it Taxachusetts for nothing. Great job Goldy! I’ve looked at the comparisons by state as Hunter suggested. The data shows we spend like Massachusetts (MA) but tax like Texas (TX). By the way, how come its ok to, in effect, increase taxes by car dealers $150? But not to help with spending on the poor and children (MA) but increase the profits of car dealers (TX)? Anybody care to comment on why the government of WA says car dealers can tax their way out of a recession but revenues are off the table for us?